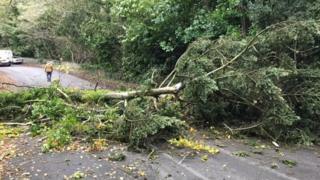 A man has described the moment he narrowly escaped being "squashed" by two falling trees when former Hurricane Ophelia hit the Isle of Man. Boris Kitching was driving from Douglas to Castletown when the first tree crashed down in front of his van. He braked and called the emergency services, before a second tree fell, trapping his car, and another motorist. Mr Kitching said they were "seconds from being squashed" in the incident during Monday's high winds. Many roads were blocked as more than 130 trees were brought down in gusts reaching 90mph (145km/h). Mr Kitching said the trees came "crashing down" and the pair remained trapped for about 40 minutes. He said: "I work as a joiner so I got my hand saw out and started cutting branches off so we could get out and the other driver helped. "Next thing a builder turned up in his van and had a chainsaw which made things a lot easier". BBC Isle of Man reporter Mark Edwards was driving south when he came across the scene on Old Castletown Road. He said: "The driver in front had just avoided a different tree coming down and was turning when he was almost hit for a second time. "Both were extremely lucky not be hit."